March 23, 2015 March 27, 2015 ~ Trevis Dampier Sr.
I’m not going to tell you anything different than you already know. We’re not going to talk about sauces or if you add broccoli to your spaghetti. What I want to talk about is how you enhance whatever spectacular masterpiece you create into a delectable work of art that you will always cherish and remember. Let’s say you like cooking with ground beef. Add Italian Sausage. Let’s say you like ground turkey.Add Italian Sausage. With cheese. Add Italian Sausage. With veggies. Add Italian Sausage. Whatever you do. Add Italian Sausage. Man! This just adds a spice to your life. The cream of the crop. The ice to water. It will enhance your meal to the fullest extent! Add a little bit of barbecue sauce to your sauce and it will make a huge difference as well. 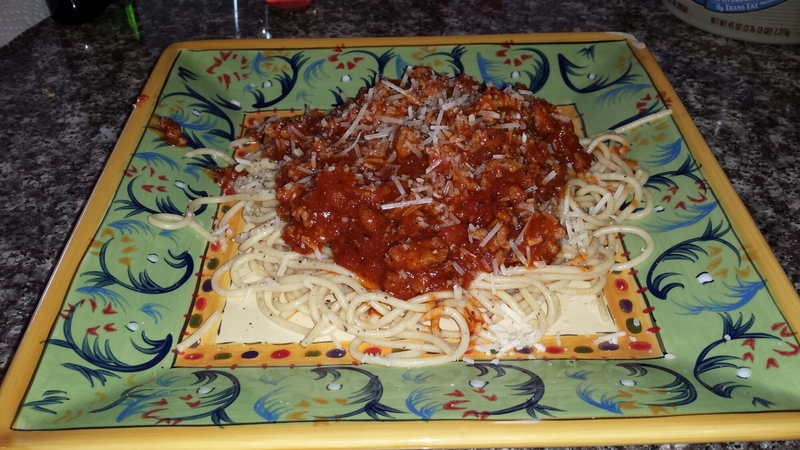 I just made my spaghetti with all Italian sausage with whole wheat noodles to get my fix of fiber and added barbecue sauce to my pasta sauce to make it a complete success. Sprinkle some ground Parmesan cheese on it with a little bit of hot sauce and you are truly living the dream. That’s live action eating! I hope you are enjoying your Sunday and I look forward to speaking with you on the next round. I have some Walking Dead to watch tonight so I’ll see you on the next run. Keep hope alive! < Previous Yippee Ki Yay..I’m eating at Three today!! Next > I’ll drive thru rain and smog for my Road Dog!! !